MORGAN COUNTY, Ind. -- One person is dead and four others were injured after a Friday night crash involving a semi-truck in Morgan County. Emergency responders were called to the 55-mile marker on I-70 around 8:15 p.m. on reports that a passenger van and a semi-truck were involved in a crash. Indiana State Police said the van carrying five people failed to slow down or move over to avoid a "nearly stopped" semi-truck. The driver, Shane Oakley, 43, of Greenup, Il, was pronounced deceased at the scene. Oakley's four passengers in the van, including his two daughters and wife, were transported to Methodist Hospital in Indianapolis. 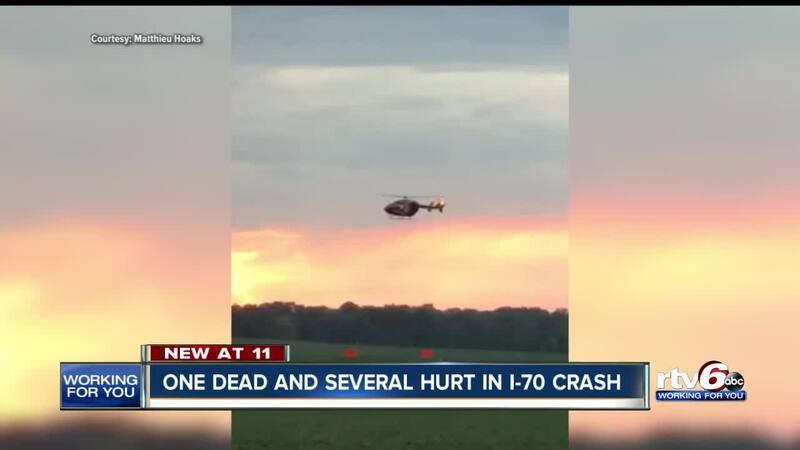 A 19-year-old man was taken to the hospital by a medical aircraft and is in critical condition. The crash is still under investigation by the Indiana State Police.